ADV-8208 - 8-Channel ASI to IP Gateway | AdvancedDigital Inc.
ADV-8208 ASI to IP Gateway provides a cost effective and efficient solution for delivering digital TV content over IP networks. It is a high performance real-time video gateway that can convert up to 8x MPEG Transport Streams from ASI to IP. Each MPEG Transport Stream can include either MPEG-2 or MPEG-4 (H.264) video content in SD or HD format. ADV-8208 has been designed to meet the demanding requirements of post-production, Contribution and Distribution applications enabling multiple MPEG transport streams to be transported through Gigabit Ethernet connections over IP networks. Create both SPTS as well as MPTS. 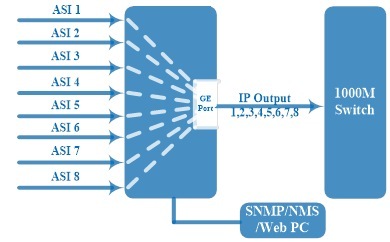 – Contribution and Distribution: interfacing traditional MPEG equipment with IP networks for transport. – Video Distribution over IP backbones. Click on “ADV-8208 Datasheet” for technical specifications.